The new Play:5 offers a beautiful, sophisticated design that we love, but more importantly, the sound it delivers is superb. Yes it's slightly bass biased, there is no hi-res support and it isn't cheap, but the new Play:5 is an all-round fantastic speaker. Sonos is far from a new player in the multi-room speaker sector. It's been playing the game and playing it well for the last decade. However, multi-room is a very different market now to when Sonos first appeared - competition has increased significantly and, as streaming music is now the norm, lots of manufacturers are after a slice of the pie. The original Sonos Play:5 launched five years ago and, up until now, it held the crown as the biggest, most badass speaker in the Sonos line-up. For 2015, the company has introduced a new Play:5; a refreshed and entirely redesigned successor, looking to show the rest of the market what its experience offers. The new Play:5 is clearly cut from the same cloth as the original, but the new speaker makes its predecessor look dated. It's obvious there is a big difference in design between the two - but looks aren't everything. When it comes to multi-room audio it's all-important sound quality that's just as, if not more, important than design. Does the new Sonos Play:5 deliver the full marriage-material package? The new Play:5 is a stunning yet subtle product, insofar as boxes that pump out your favourite tunes go anyway. Sonos doesn't do complicated, as the black or white monotone options suggest (both of which comes with a black grille). Simple and sophisticated is what the new Play:5 goes for, delivering clean lines from its curved oblong design - a theme found throughout Sonos's multi-room speaker range. It features curves that sweep around its edges and top, before narrowing at the rear, giving it a similar shape to the Play:3, albeit on a larger scale. The Play:5 is more refined than the existing model, with a more futuristic identity that we hope to see the Play:3 eventually follow in form. It is neither small nor light however, measuring 364 x 204 x 154mm and weighing 6.36kgs. The Play:5 is a home speaker though - certainly not one you'll be carting around in a bag or bringing to the beach - so neither of these points really matter. The new Play:5 has been three years in the making and the front grille - comprised of 60,000 holes broken up only by the Sonos brand tag - is one of the most interesting design details, despite being made from plastic rather than metal. Sonos informed us that metal was the primary choice aesthetically, but such a material choice wouldn't be best for sound. The Sonos brand tag sits directly in the centre of the speaker, either at the top or the right or left hand side, depending on the product's orientation as it's possible to sit it upright rather than horizontally. No matter which position the speaker, though, the brand tag sits in front of the transducer, which would theoretically affect high-frequency sounds if not for the 828 holes drilled into this brand tag too. Crazy, right? The tag isn't just about lots of tiny holes or ensuring everyone knows you've opted for Sonos as your multi-room speaker system though. It's designed to be helpful when it comes to locating controls, which are now capacitive touch-based and sit either side and above of the tag. The idea is that you needn't look for the controls too hard and a quick tap or swipe in roughly the right place will deliver an instantaneous response. Right increases the volume, left decreases it; a swipe from one side to the other will skip a track. The controls also benefit from smart sensors that detect the orientation of the speaker to ensure that volume increase is always facing in its logical direction. Moving from physical buttons to capacitive touch could be seen as a risky move as many will appreciate the visual aspect and direct response actual buttons provides - a criticism we had of the Ministry of Sound Audio L Plus. But we love the new Sonos controls and how they're integrated seamlessly into the design. They're a pleasure to use. The casing of the new Play:5 is also plastic like the grille, which means you're essentially paying £429 for a mostly plastic speaker. It looks and feels every bit as well-made as previous Sonos speakers though, if not more so. The casing has a matte finish but a ceramic feel, which makes it lovely to touch and control. The rear continues with the simple design trend, featuring just an Ethernet port, 3.5mm line-in, power lead, and a pairing button towards the bottom of the speaker. Despite being not much more than a black box, every aspect of the Sonos Play:5 has clearly been considered; it's smart, sophisticated, but perhaps best of all, it's simple. As we mentioned, looks aren't everything. Fortunately the new Sonos Play:5 has the audible personality to match its subtle but successful design. It's audio output is slightly bass heavy, as was the original Play:5, but the overall sound is absolutely brilliant. Behind the front grille are three tweeters, three long-throw mid-woofers and six Class-D digital amplifiers, as well as two microphones that have been built-in for future features, such as realising the potential of the new Trueplay software - more on that later. Sonos has a habit of introducing future tech within its speakers even if it isn't used straight away: the Play:3 had dual Wi-Fi inside two years before it was put to use, for example. We listened to several tracks and genres - from Adele's Someone Like You to Massive Attack's Unfinished Symphony and vocals - and instruments were as crisp and full-bodied as the booming bass. The Play:5 covers all departments well, offering a wide and impressive sound quality, and for those who enjoy a bit of extra bass, it won't disappoint. We also asked a musician friend to pop over and listen to one of his own tracks, The Art of Silent War, to see whether he thought the new Play:5 did it justice and reproduced the track the way he intended it to sound. In his opinion, highs and lows were perfectly separated and he thought it enhanced the bass of the track in a positive way. Stereo output is possible by using a pair of Play:5 speakers (or any combination of the same Sonos speakers, for that matter). During a demo before we got the new Play:5 home for review, we experienced a stereo pairing in both horizontal and vertical orientations. When turned horizontally the speakers deliver a wider soundstage to our ears, delivering sound just as impressive right at the sides of the room as the sweet-spot in the middle of the room. Unlike some of its competitors, Sonos supports up to CD quality (16-bit), but it has yet to jump on the hi-res (24-bit) bandwagon and it isn't likely to do so any time soon. That may come as a disappointment to some. We were told by the company's sound leader, Giles Martin, that "it makes no sense in the consumer world", adding that he or the company "refuse to play the numbers game”. Martin also said that hi-res is a convenient way of audio companies doing what car companies do with their "0 to 60mph": he thinks most people would struggle to spot the difference between CD quality and a 24-bit file, whether 96kHz or 192kHz. However, for those high-end listeners, a number of competitors do offer hi-resolution, including Bluesound, Sony and LG - so whether the difference is noticeable or not to many, it is happening in multi-room products, and Sonos isn't part of that just yet, not even for down-sampling. Even so, we didn't feel as though our experience from the Play:5 was in any way hindered by the lack of hi-res support, but for those who can't live without it, you'll have to live without Sonos and its new speaker. Sonos delivers simplicity and it's successful in doing so in both design and software terms. Take the app, which is up there as the best multi-room solution out there. Spotify integration has been weak in the past, especially since Spotify has added personal recommendations and other features, but a recent update to the Sonos app has dramatically improved the experience and more features are on their way, along with support for Apple Music. Everything is actioned through the Sonos app, rather than through individual streaming apps, but it's a smooth experience rather than a barrier. You can search by artist, track, album, playlist, stations, hosts and podcasts and the app will search through all the compatible services it supports. Now that's much easier than going through each one individually. The search icon sits in the top right of the app window, so is easily accessible, while the name of the room that the Sonos speaker is in (which is user definable) sits in the middle. In the top left you'll find everything else including Sonos favourites and Sonos playlists, as well as the option to add music services. Alarms and settings are also found within this tab, the latter of which will allow you to add a new speaker or subwoofer, as well as change equalisation settings for each individual room (if you have more than one Sonos connected). When a track is playing, there is also the option to turn on crossfade to ensure there is never a dull moment of silence. Like the other Sonos speakers, the new Play:5 can be connected directly to your router using an Ethernet cable, or wireless connectivity is available. We recommend the latter as the Sonos wireless mesh network technology is brilliant and it also means you don't have to use up those precious router Ethernet ports or trail wires anywhere. There's no longer the need for a Sonos Hub, as was necessary at the beginning of the system's life, to further simplify things. We have yet to experience any drop-outs or connection issues and we've experienced complete synchronisation across all speakers, no problems. Trueplay is a new software feature that will arrive to all Sonos users as an over-the-air update. In a nutshell, Trueplay enhances audio based on the speaker's position to surrounding surfaces and optimises equalisation for the room it's placed in. By using the in-built microphone of your Apple smart device (iOS 7 and above, no Android just yet due to standardisation issues) to collect information about the room you are in, the tuning process requires you to hold your smart device and wave it up and down whilst walking around the room (no, really). It emits a series of sounds and after 45-seconds (of admittedly looking and feeling rather silly) it's all done. You have to be completely silent as to not confuse the readings, but if you do anything wrong then you'll be told to redo it. If you want to know more, follow the link below to read our Trueplay explained feature. We were able to tune both our new Play:5 in the living room and the Play:1 we have setup in our office according to their surroundings. In their normal positions, with ample space around them, we noticed a minimal difference when we turned Trueplay on or off. But when we placed the Play:5 behind the sofa and re-tuned it, the difference was far more significant. That's where Trueplay really shows its worth: by avoiding the muddy sound that can occur when a speaker it too close to a wall. Better still, Trueplay allows everyone with Sonos speakers, old or new, to get the best out of them. 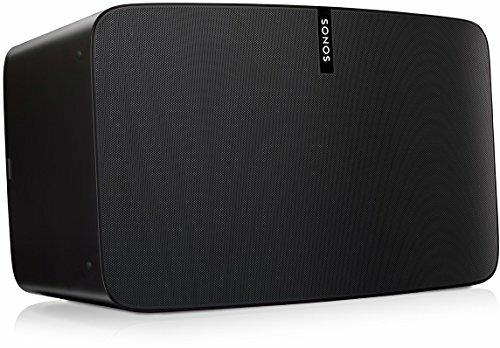 You needn't buy the new Play:5 to benefit from boosting your current Sonos sound, but if you are looking for a heavyweight lead speaker then it's certainly a solid choice. But more importantly the sound it delivers is superb, especially with Trueplay software tuning. Yes it's slightly bass biased, there's no hi-res support and it's not cheap, but the new Play:5 is all-round fantastic and well worth the splash of cash. Sonos has competition nipping at its heels left, right and centre, but the new Play:5 shows what 13 years of experience can deliver. It's the ideal way to start a Sonos multi-room system, or add a badass centre piece to an existing one. So is the Sonos Play:5 the full marriage-material package? We'll certainly be loving it for many years to come.